A Broad Spectrum disinfectant powder. 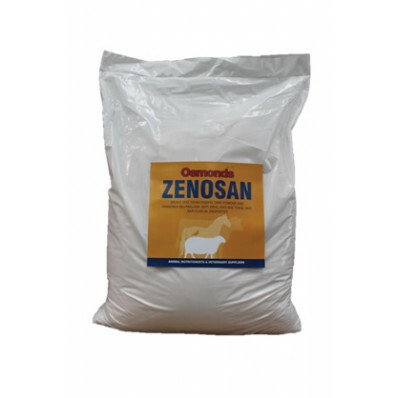 Osmonds Zenosan is a broad spectrum powdered disinfectant and Ammonia Neutraliser with anti-viral, anti-bacteria and anti-fungal properties. Zenosan works to enhance the environment by lowering the levels of ammonia and other noxious gasses thus promoting healthier and more profitable livestock. Using Zenosan can help to minimise the activity of disease causing micro-organisms, which can help to reduce the challenge to livestock from bacteria, viruses, fungi and moulds. Zenosan is made from natural ingredients alongside a safe disinfectant, meaning it is safe to leave down whilst animals are feeding. CALVES: 50-60g per calf pen daily for 3 days, then weekly. Can also be used in stables, kennels and catteries, small animal cages, rabbit hutches, pigeon lofts and avierys.